This method is the way I tend to do all my deco. It is a way of placing any item or group of items onto a particular tile. It is the easiest way to stack a bunch of chests or place a painting on a wall in the exact position you want first time, everytime. The only condition is you need to be able to ‘stand’ on the tile to place the barrel. In the case of a painting stand on the tile in front of the part of the wall you wish to place it on. You will find the items will generally stack in the order you place them in the barrel. So first item in is the one on top of the stack when the barrel is chopped. In the picture above I have placed the rose, butterfly, bowl and table in the barrel, chopped the barrel so all items fall to the one tile, and then lock, lifted and turned the items to the desired positions. The barrel method is sometimes the only way you may place two ‘blessed’ items on the same tile, without getting a ‘blocking’ message, ie two vet reward statuettes that you want one above the other. that sit too low down, etc. 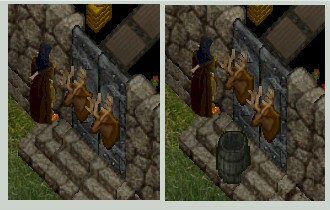 In this case I have demonstrated the difference with a stag deed, in the first picture both stag heads are targeted directly on the tile in front of each door, in the second the first is targeted on the barrel placed on the tile in front of the door and the second is as per its original placement. As you can see in the second pic the stag head targeted on the barrel is higher in its placement. Using the barrel as a targeting tool means that placing gozas on steps, especially those inside a castle or keep at the top of the stairs may be done without the goza disappearing under the stairs. Place the barrel where you want the goza and target it with the goza and it will sit nicely on the tile you want. Just chop the barrel away after placement. The only real ‘caution’ you need to take if using the trash barrel method to place, is to understand that if you place something in the barrel and lose connection for whatever reason, you need to get back in before the item is deleted in the barrel. This is a risk you take using this method to place. You may use wooden crates or boxes to do the same thing by placing items in them and then chopping the crate with an axe, however you need a large supply of them if you are doing a lot of deco as each time you chop a crate you will need to get another for the next placement. The beauty of the trash barrel is you can use it over and over without wasting materials on building and then destroying crates or boxes. The use of gozas in deco is a must. They may be used in all manner of ways and have allowed a lot of additional deco tricks to be used to get some great affects and to put things in places where they have never before been able to be put. The following are some tips and tricks with using gozas in your deco. When gozas (made by tailors) first came in as a deco item, I, like many thought wow, finally something to put on the floor of my Castle to take away the boring stone look. So having carpeted a few rooms and placing a few bear and polar rugs, I left home to return to find those rugs had ‘flipped’ under the gozas so it became every second ‘log-in’ that I could see my rugs, the alternate days they were ‘under’ the gozas. This was aggravating to say the least, but having persisted with various attempts at getting them to ‘rise’ and to stay above the gozas permanently I finally figured it out. 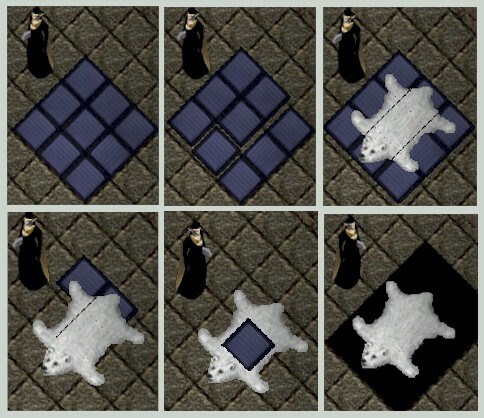 The trick works for anything such as bear rugs, abbatoirs, arcane circles etc that do this ‘flipping’ business if placed directly on goza carpeting. Firstly, using any colour single gozas place them 3 x 3 across/down. Then raise them all with 2 lifts with the deco tool. (not more than 2 if you still wish to walk on them, as above 2 lifts they will block movement). Place the rug, arcane or abbatoir on the raised gozas, chop out the gozas you can see, and to get the other one out from under the middle either mount and dismount, or leave house and return to force it to ‘flip’. Chop this last one away. Place the ‘real’ goza carpet under the rug, in this case I used black gozas as my ‘carpet’. The bonus of raising them like this is you also do away with the unsightly ‘lines’ you tend to get even when placing directly on some floor surfaces. 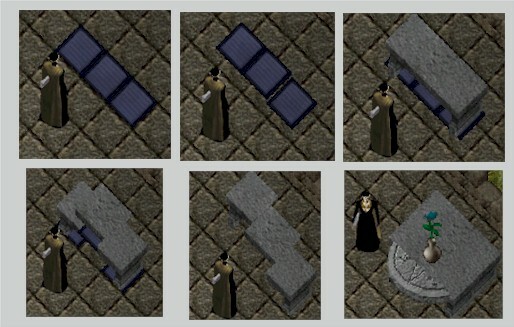 You may use gozas to place these items higher if you do not wish to walk on them. 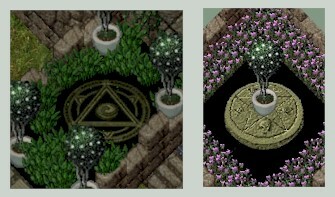 In the picture below, the arcane circle is placed above black goza and may be walked over and used as a circle for gaining a spellweaving focus, but the abbatoirs which are on the corner roofs of my castle have been raised, about 7 lifts on each goza, so that they are dead centre of the squares instead of to one side, or ‘offset’ to square, if they were placed normally. Remember, when using gozas this way if a ‘piece’ of your rug or circle etc drops at any point to raise it level with the other pieces before attempting to chop it out with an axe back to deed form or it will be destroyed. When re-deeding, all the parts of the deeded item need to be on the same level. Another really useful deco trick using gozas is to ‘stack’ or ‘raise’ deeded items so that you can maximise your floor space, or ‘see’ those hidden placements behind walls, thus also saving space. To stack aquariums, place 2 gozas on the tiles you wish your aquariums to be. Raise them 10 times each with the deco tool and place your first aquarium by targeting the western side goza, then place the other aquarium on the tiles where your gozas sat initially before lifting. This can also be done with any ‘deeded’ item such as water troughs and stone tables. If you cant ‘see’ a goza to chop out after placement, it doesn’t matter it will stay hidden, and doesn’t take a up a lockdown. One of the real benefits to this trick is it allows you to place deeded item on the tiles closest to an eastern wall and have them raised so that you can actually see the item, most things placed on those tiles end up being ‘behind’ the wall so can only be seen with circle of transparency on. While this is ok if you don’t actually want to see the item, if you do, until now you have been forced to move it out a tile to make it visible. Gozas allow you to raise these items allowing you to use those tiles. Examples of this benefit are shown below. 1. This water trough used as a display case would be hidden behind the wall if not raised with gozas. Raise gozas to the maximum height then drop them back down by 2-3 with the tool before placing the trough, this allows placing of items on top of the troughs. 2. This water trough has been raised and then had the royal blue gozas and sword placed on before under placing with the rest of the display cases. 3. 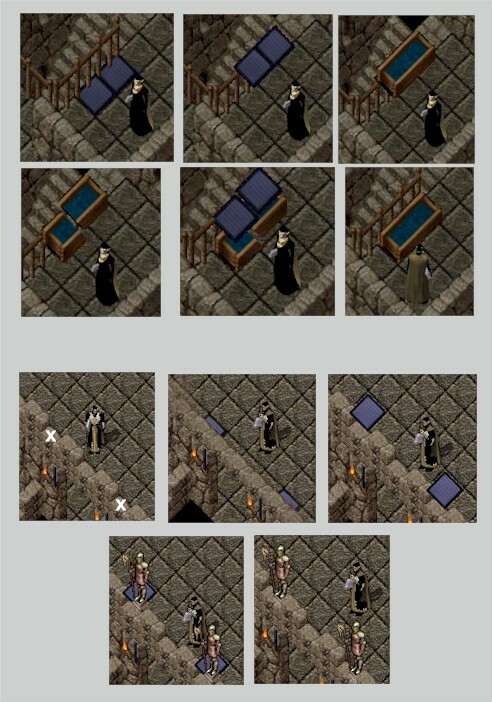 In Castles where there are only 3 tiles in width in the wings, a table placed on the tile closest to the eastern wall would only show the very edge if not lifted. In this pic the tables have been raised as per the trough in  to allow the tabletop to be used for display, while allowing you to walk up the centre tile to ‘view’ the display. Another useful thing about being able to raise addons this way, is by then dropping the gozas with the deco tool, once the item is positioned, you can ‘split’ the addon into parts. Below shows the process for splitting a 3 tile table, also shown is the southern three pieces of an abbatoir, once the remaining pieces were chopped away and then the height raised to match two tables forming a ‘lip’. Basically, place gozas, raise, place the addon, then lower the gozas to force the ‘split’ then chop away the gozas and bits of the addon you don’t wish to use. In the above pictures you have two ‘altered’ tables, one in plain stone which forms a cross, the other in shadow which forms a T shape. In the first case the ‘long’ part of the tables have had the ‘ends’ removed so you don’t have multiple ‘table legs’ showing, nor gaps in the cross pieces. The beauty of this is that your table tops form one united slab, the drawback is obviously if you try to ‘move’ the tables they will be destroyed as parts are ‘missing’. Luckily stone is an item which any miner/stonemason can replace for nil cost other than ‘time’. 2d. Using Gozas to place deeded items or furniture on tiles not normally able to be placed on. Top: The two gozas placed against the stairwell are not normally able to be walked on. You can place items of a single tile nature by dropping the item on them, however to place a two tile deeded item you will always get an ‘unable to be constructed message’ unless you use gozas. As shown, place the gozas, raise them to above the level of the handrail. Place your water trough. Targeting the very edge of the goza that you can ‘just’ see, use your deco tool to drop the west side as shown. Once the item is ‘split’ each piece maybe lowered to the desired position is obtained. Here I have lowered both sides to the ground. These unusable tiles are now useable by the trough and don’t block movement as you couldn’t walk there anyway! 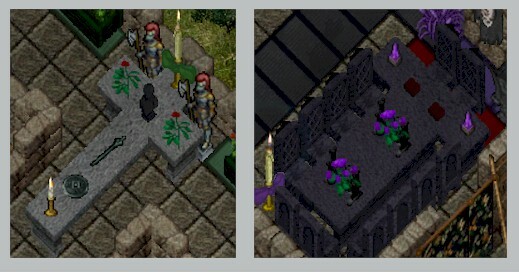 Bottom: Placing deeded addons on the castle battlements as indicated by the two white crosses. Firstly put on circle of transparency (circ) and place two gozas directly behind the part of wall you wish to place the items, you can see a ‘1/4′ tile against the wall with circ on. Raise the gozas until they are above the height of the wall and turn circ off to check that the whole goza is visible. Place your deeded item and then chop the gozas away. You may then lower the item to the correct position. 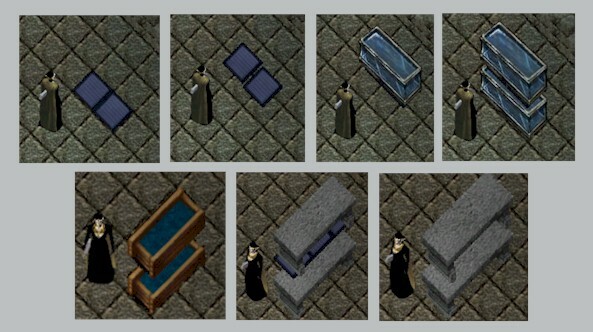 The ability to place deeded items like this, especially on the narrow parts of castles, allows you to deco without taking up all your floor space with ‘blocking’ items.